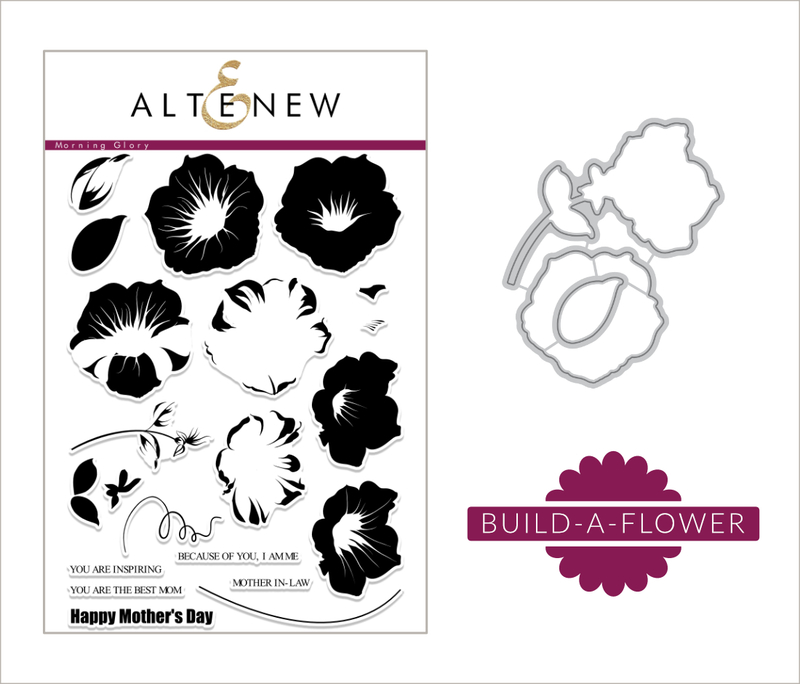 Today Altenew is releasing the May Build-A-Flower set called Morning Glory. I created a simple layout doing a lot of flower stamping. I chose to use blue tones with the flowers. I stamped some of the images on some Solar Crest White cardstock from Altenew and also stamped two images seperately. I popped them onto foam dots to add dimension and detail. I picked blue hues that match the patterned paper I picked from the Reflection Scrapbook collection. The Deep Blue Seas Ink set was a perfect fit. For the greenery I used some Forest Glades and Frayed Leaf Crip ink. A couple of enamel dots and butterflies add the finishing touch. The sentiments in this set fit perfectly so I didn't need to use anything else. This set is problably my favourite to date but I think I say that for every BAF set that comes. Simple but beautiful page. 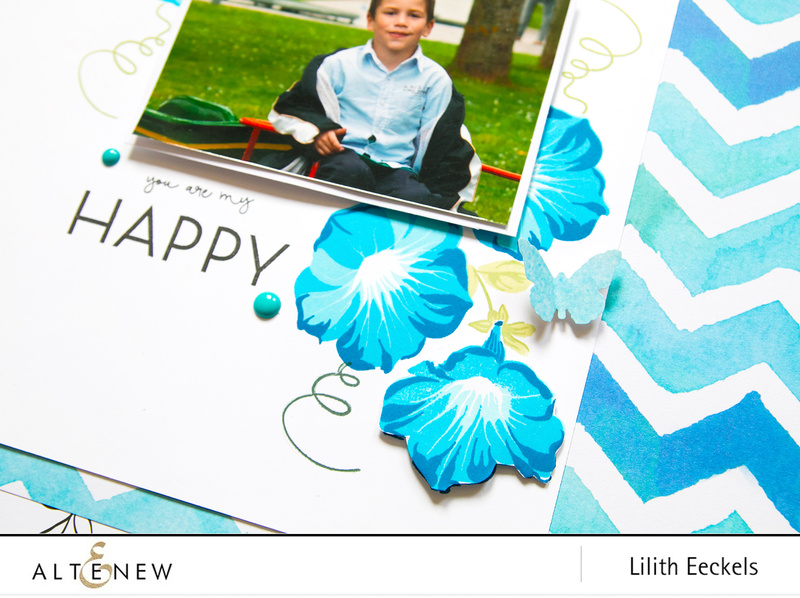 Love the shades of blue and the Morning Glories make a colorful backdrop to your photo. Thanks for sharing your inspiration and that handsome young man! The new Build-A-Flower set is gorgeous. And I love the layout. The blue color is so eye-catching and fresh! 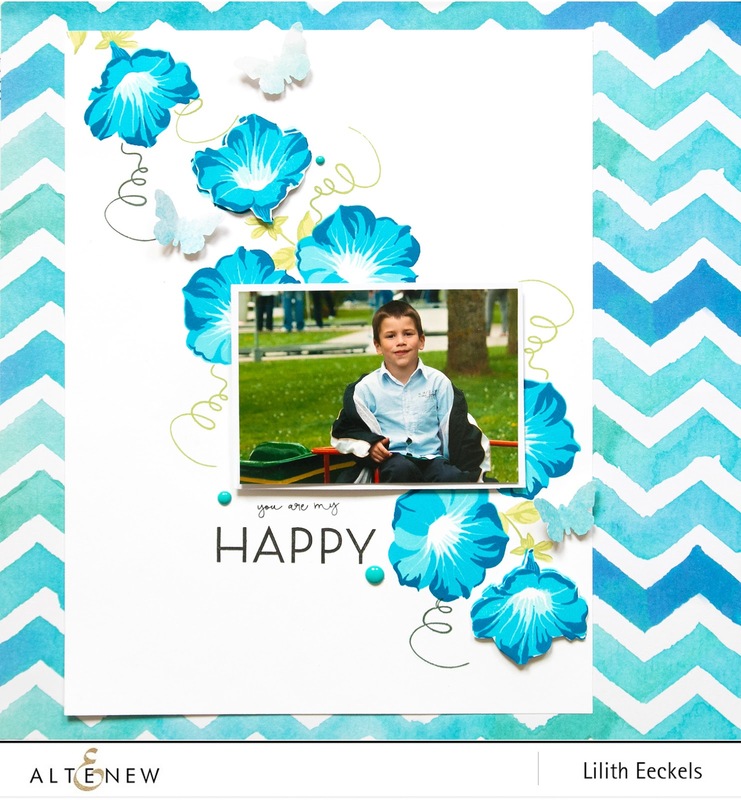 Lovely layout using the Morning Glory stamps in blue ink! some attention. 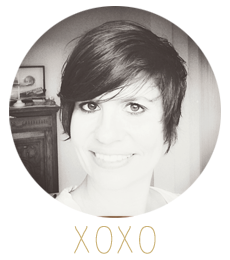 Your page is great. LOVE this layout with all of the blue morning glories. Blue is my favorite color and morning glories are one of my favorite flowers. So pretty! Perfect match. I thought you painted that background! Lovely spotlight on the photo. Fun layout! Even using flowers for a boy, it's not too girly. Love those flowers, it really adds depth to your beautiful layout! 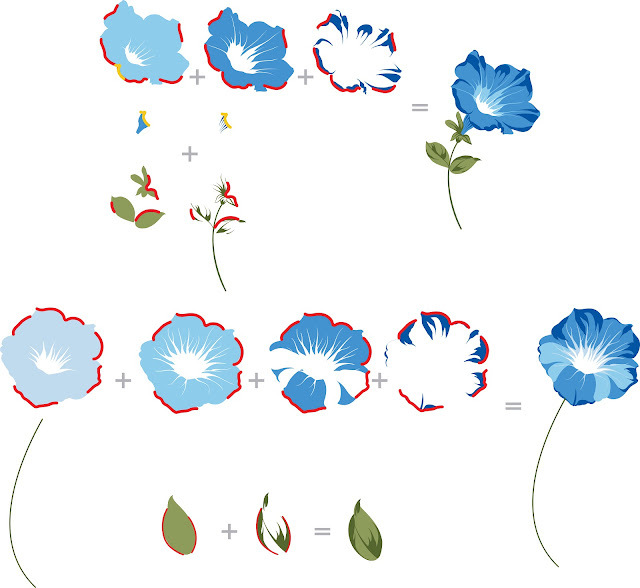 Beautiful page showing off these lovely morning glories! Love your color combo! Lovely layout. Love the gorgeous and vibrant color and the contrast between the organic florals and the graphic zig zags. I love seeing these stamps used on layouts. Such a pretty layout! The blue shades of the flowers goes so nicely with your background paper. The butterflies were a great finishing touch! This is another gorgeous layering flower with beautiful details. 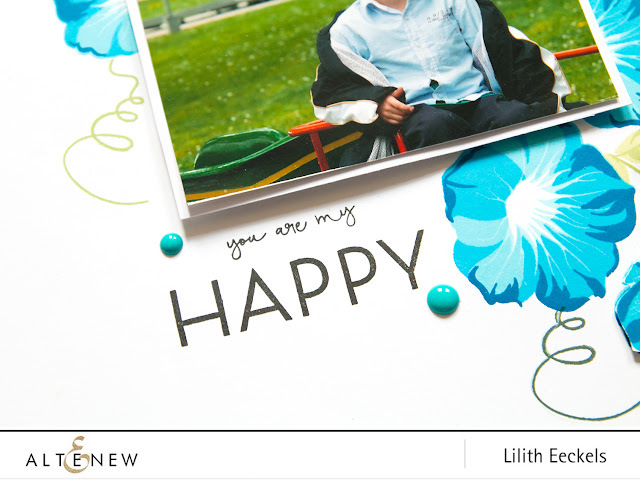 Love the way you've used them on your beautiful layout. Thanks for the inspiration! Gorgeous layout! I love the morning glories! Thanks for the inspiration! Oo, I love how cohesive this whole layout is with the flowers and the butterflies matching your son's shirt and the leaves matching the greenery behind him. It's just so pretty. Thanks for sharing these lovely ideas with us! Wonderful layout. I like the shades of blue. 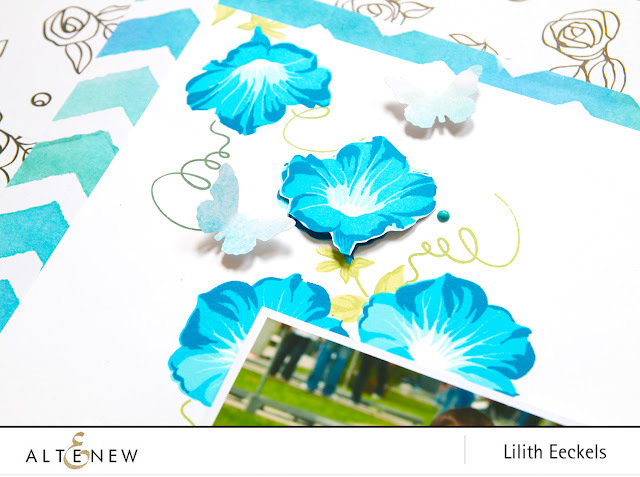 Oh Lilith, this sentiment IS perfect for this layout and the colour you used on the Morning Glories is perfect as well! Beautifully done. Gorgeous layout. Love the color combo.